Left (click to enlarge) : The C-3 or reductive pentose phosphate cycle (RPP). This reaction, in which carbon is fixed, reduced, and utilized, involves the formation of intermediate sugar phosphates in a cyclic sequence. One complete RPP cycle incorporates three molecules of carbon dioxide and produces one molecule of the three-carbon compound glyceraldehyde 3-phosphate. 3. 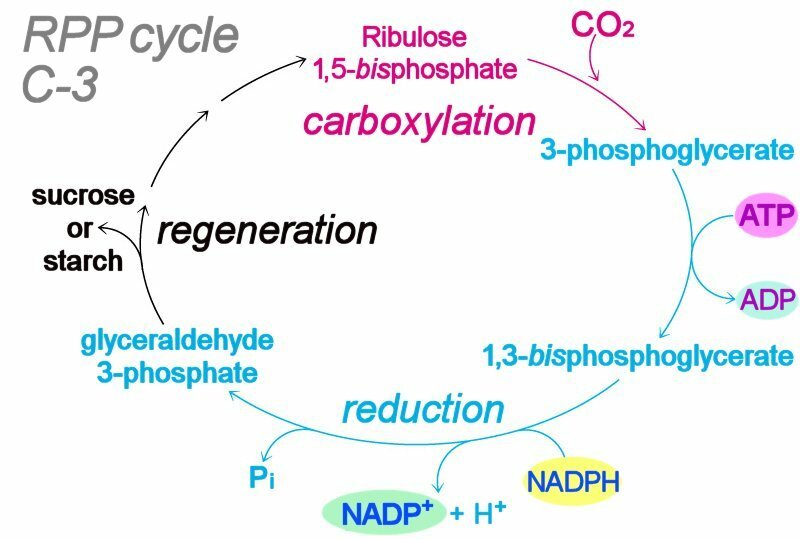 Regeneration of the CO2 acceptor moleucle (ribulose 1,5-bisphosphate). Some of the glyceraldehyde 3-phosphate generated in the reductive stage undergoes gluconeogenesis to form glucose. In plants, glucose is converted to sucrose or starch for later use.The C-3 reactions are sometimes called the "dark reactions" of photosynthesis because photon energy is not used directly – the reactions are light-independent. However, ATP and NADPH generated by light-dependent photophosphorylation reactions are required.